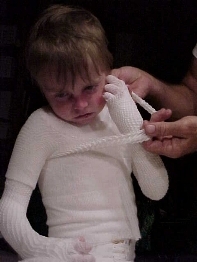 The arms are all wrapped and the under-prep is done; the creams, ointments, lotions and potions are on, the non stick dressings are applied… and we are ready to start the torso. around it to go to the back again under the armpit. Actually – it does not matter whether it starts to cross on front or back, the pattern is the same. It will then pass over the opposite shoulder, around it and back thru to back under armpit. It will keep going around the shoulder to the front. around the shoulder and across the chest to complete the X. Finish wrapping the torso. This is the base wrap. From here are options. 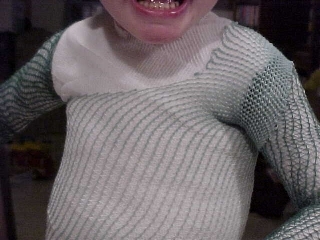 For light wrap, we go around the torso with 4″ J&J Sof-Kling to give more strength to body wrap. 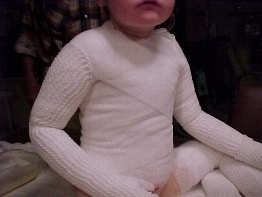 Add your padding where ever you need it for protection and absorbancy. 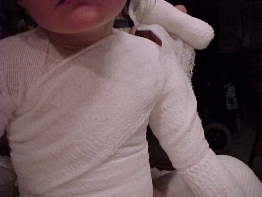 Finish with stretch gauze, which we will talk about later. The heavy duty, protect the armpits from most assault method is what we use the most now. After the Conform layer, we use a layer of Kerlix. and around the upper arm. Cross over the body and around the other shoulder and upper arm. This pattern of crossing over and around should be used until we have done as much as can be covered. 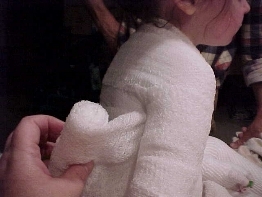 We wrap one layer around the rest of the body to the waist. We also put a layer of Sof-Kling over the top of this for more strength. Remember, our kids are very active and we want them really protected. 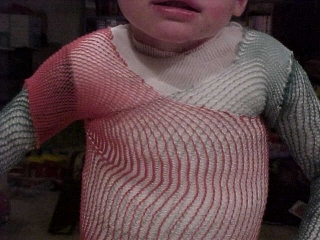 Method 1: this is a single tube sleeveless shirt. Take a piece of tube that is the length you need. Our kids use one about 15 inches long. About 3 or 4 inches down, make a snip into each side. put one arm through one of the snipped holes. Pass over the head, putting it into the tube end hole and the other arm through the other snipped hole. 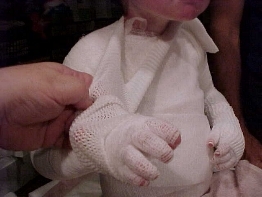 Method 2: This idea came from Lorraine, Garrett’s mom. It is the super dooper keep those armpits under control method. I love it and have adopted it. 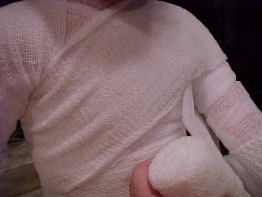 It also keeps the stretch tube gauze away form the neck when you need it away, because it makes a v-neck tee shirt. 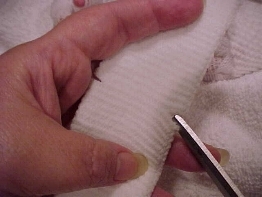 Take two pieces of the torso tube gauze and about 5 or 6 inched down one side make a snip. Take the first and gather it all up with the short side of the cut towards you. and pull it down the body. Do the same on the other side. 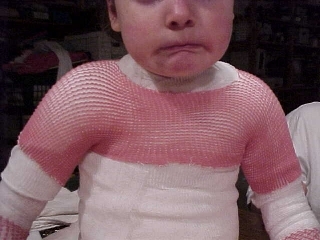 Method 3: This is for those times when you need to really keep dressings on the neck. Using method one, make your side cuts much further down. 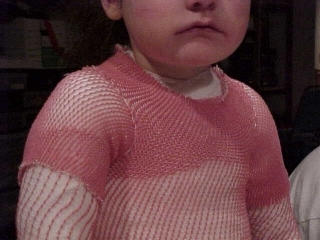 When you put it on, it will form a turtleneck. 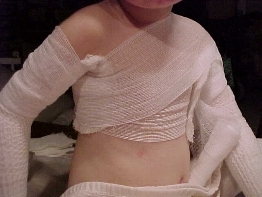 Method 4: I devised this method because, while the way the armpits in method 2 were protected was great, it leaves a deep vee in the center chest and back where the bandages were not protected and kept under control. 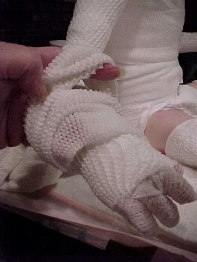 Take a piece of tube gauze, about body size and about 15 inches long. 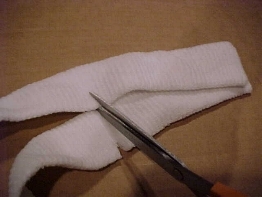 On one side cut a 2-3″ slit. On the other, cut a 4″ or so slit. 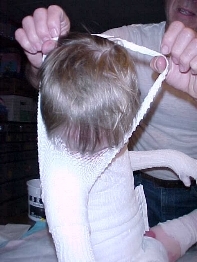 With the short slit up, pull the tube gauze over the head, with the head going through both cut holes. 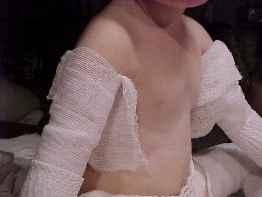 Put an arm thru the long slit. 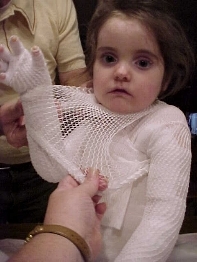 Then into the “sleeve”. Put the other arm into bottom hole and out the other “sleeve”. Now you have a crop top with sleeves. If you finish this with a method #1 sleeveless top it will cover everything well. 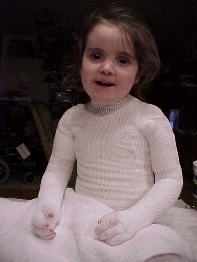 This is a personal video of the late and beloved Sheri wrapping the armpits and torso of a child with EB (Epidermolysis Bullosa) taped at Stanford in January 1998. There is a lot of chatter back and forth, some of which is not clear as there are some children crying etc on the background (including my Nicky, 14 months old at the time) but it’s still a useful video that might help some.